#117 – More history …. and games with the dog! Despite the last 12 months having had some of the wettest weather in the UK since records were kept, we seem to have managed quite a few dry days out, though the ground is frequently completely mired, being at saturation point. 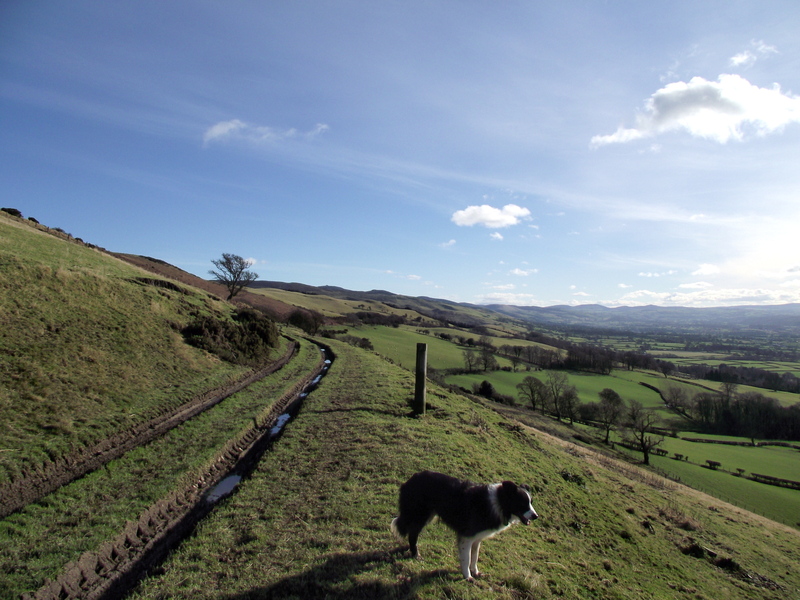 That’s when the hills become even better for walking, with the water draining off down to the soggy valleys. 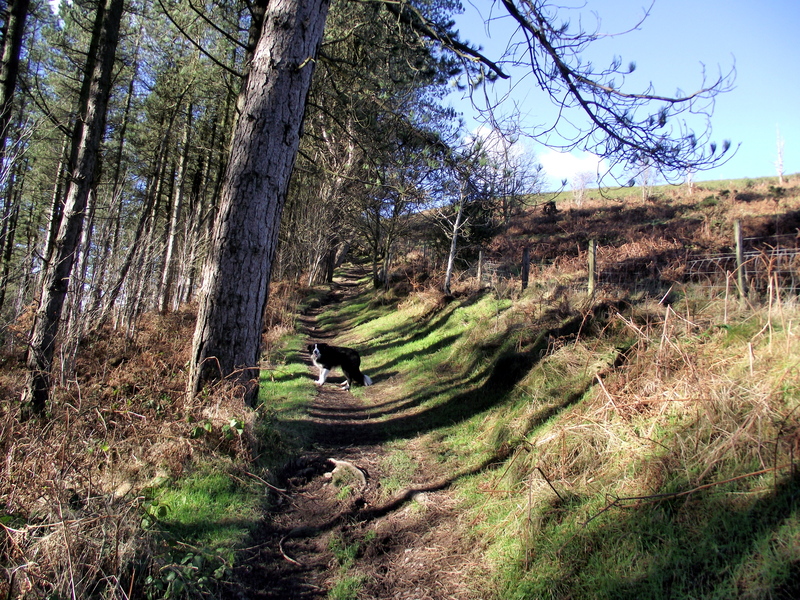 Looking back along the path to Moel Arthur …. 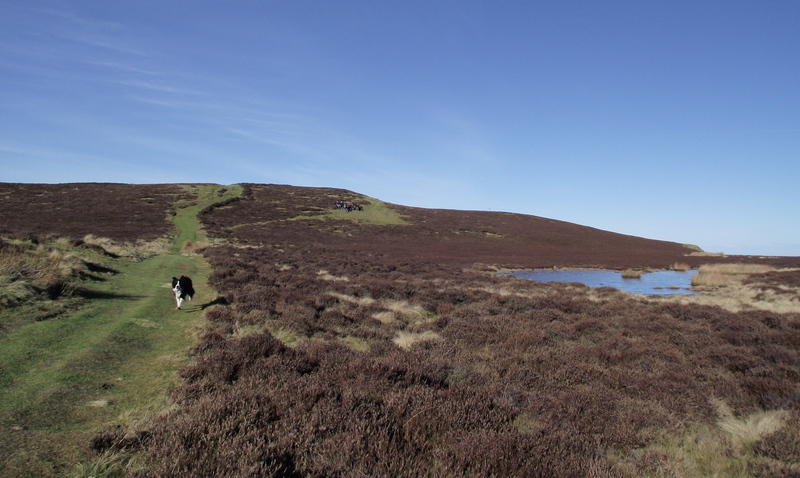 Living almost literally in the shadow of the northern end of the Clwydian Hills, we don’t have to look far for an interesting walk out. 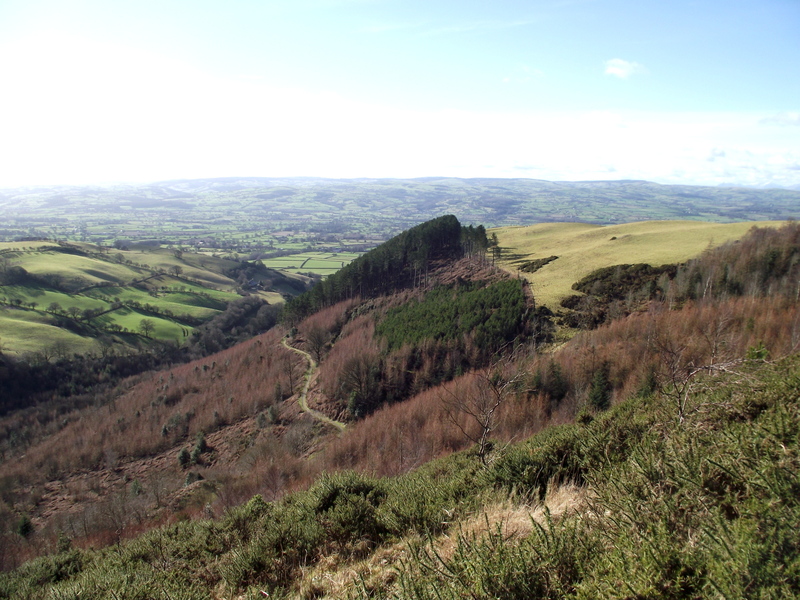 I had combined a trip over Moel Arthur and Penycloddiau last October (see post #99) but Chris hadn’t been there, and I was ready for another visit, so Penycloddiau it was! 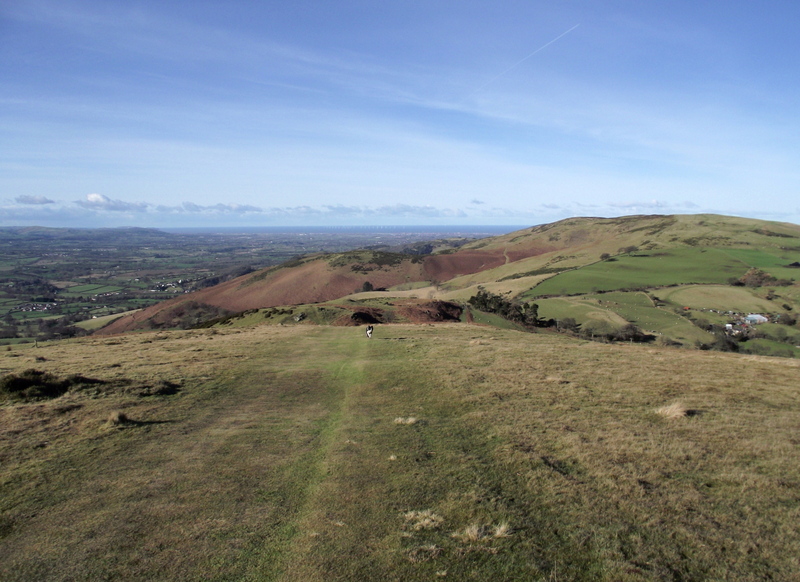 We followed the Offa’s Dyke path heading north to Penycloddiau – The name means ‘Head (or Hill) of the ditches’, a name that makes sense as height is gained – the hill is the site of an Iron Age fort, with the remains of the original ramparts and ditches being quite obvious. 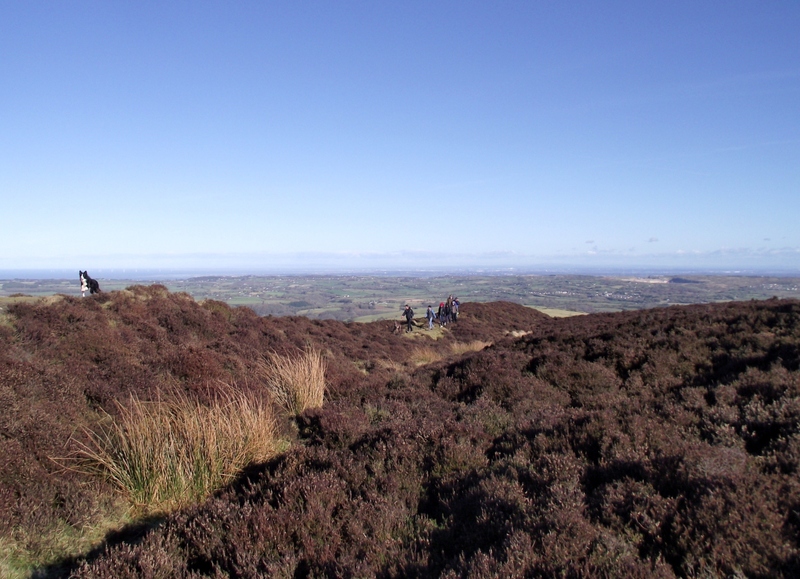 The fort covers an area of 64 acres, making it the largest of a line of ancient hill-forts in the Clwydian Range. 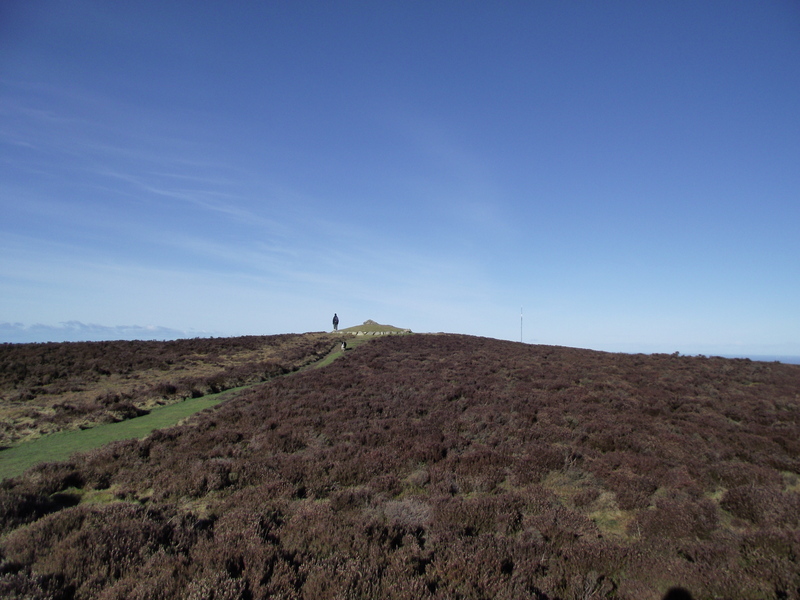 The fort was built about 2500 years ago, on a site that was already important – the people of the Bronze Age constructed a burial mound on the summit about 2000 years before the Iron Age fort was built. The fort must have been a major construction project, with high earth banks topped by a wooden fence, and deep ditches below. The site was carefully chosen, and included a pond that would have supplied water to the occupants. Despite a bright sun, the wind had a chill bite, and we didn’t linger at the summit. 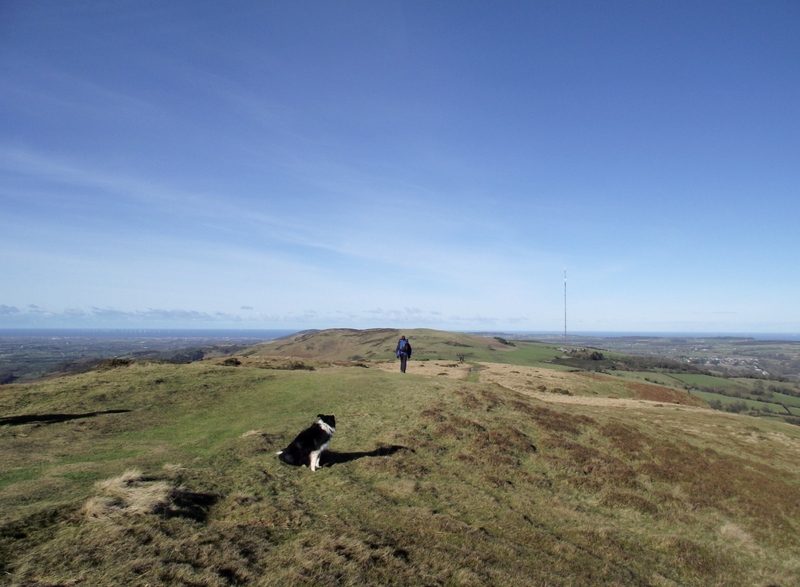 We carried on north, heading towards Moel y Parc, easy to pick out from a distance with its distinctive 750 ft (230 metres) transmitter mast bringing television and digital radio to about 300,000 consumers in Flintshire and Denbighshire (and over the English border into Cheshire). 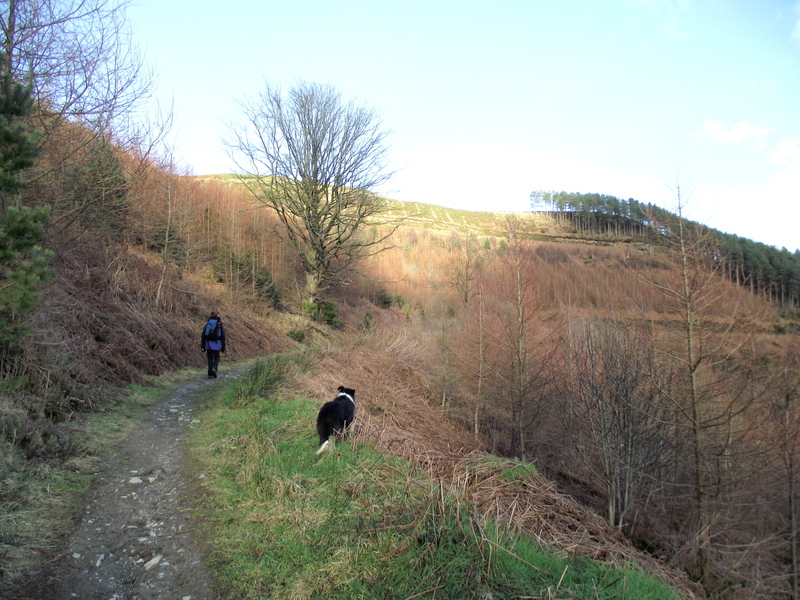 At the bwlch we turned back on ourselves, following the Clwydian Way back towards the start point. 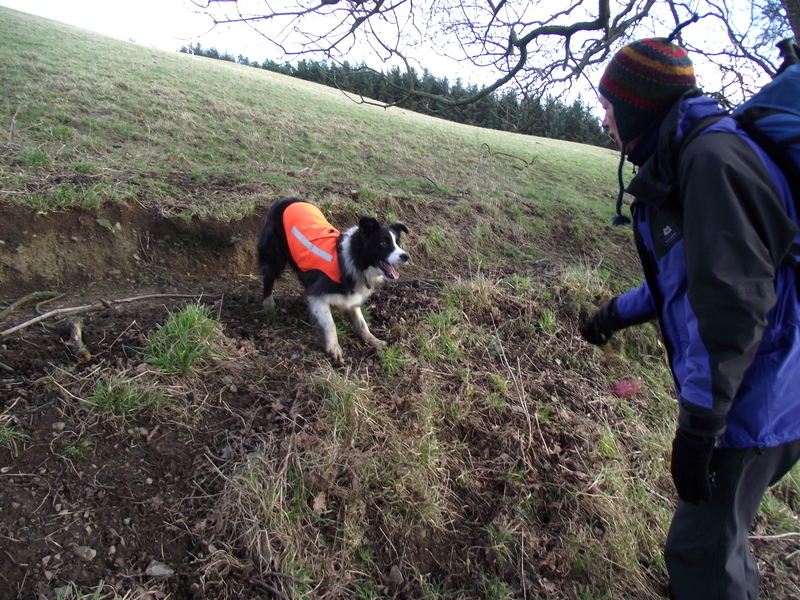 Easy walking gave us a chance to include some more Search and Rescue training with our Border Collie, ‘Mist’. 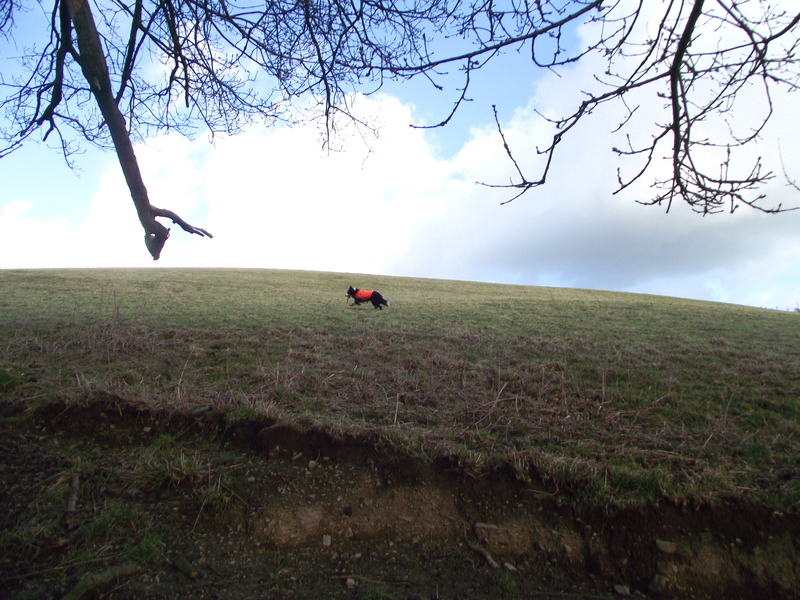 Search training starts with ‘run-outs’ over very short distances. The ‘body’ runs off with the dog’s favourite toy, trying to sound as excited as possible, whilst the handler also gets the dog excited. As the dog is released, the handler gives the command “Away find!”, and the dog runs to play with the body. The dog doesn’t get the toy until the handler arrives, and so it learns that the game only starts when the body, handler and dog are all together, and for the dog it becomes the best game in the world! ‘Mist’ is already a stage beyond that. Before the run-out, I fit her with an orange jacket, which becomes a sign for the dog that there’s a game coming up (or later on, a job to do). When she gets to the body she returns back to me and barks, then she leads me to the body. The bark is known as an ‘indication’ and is part of the search sequence. As before, when she takes me to the body, she is rewarded with a game. At the moment we are working with short runs of about 30-50 metres. These will get longer, and the dog will be encouraged to shuttle back and forth between body and handler until all are together. When that is absolutely solid, with strong ‘indications’ guaranteed every time, it will be time to search for a body that hasn’t been in view to the dog. At that stage ‘Mist’ will have to use her nose to hunt for the body. By frequent repetition, the dog learns that a human, wind-borne scent will lead to a person, and that shuttling between the body and handler and indicating the find will always lead to the same conclusion – a massive reward in the form of a game with the handler and body. 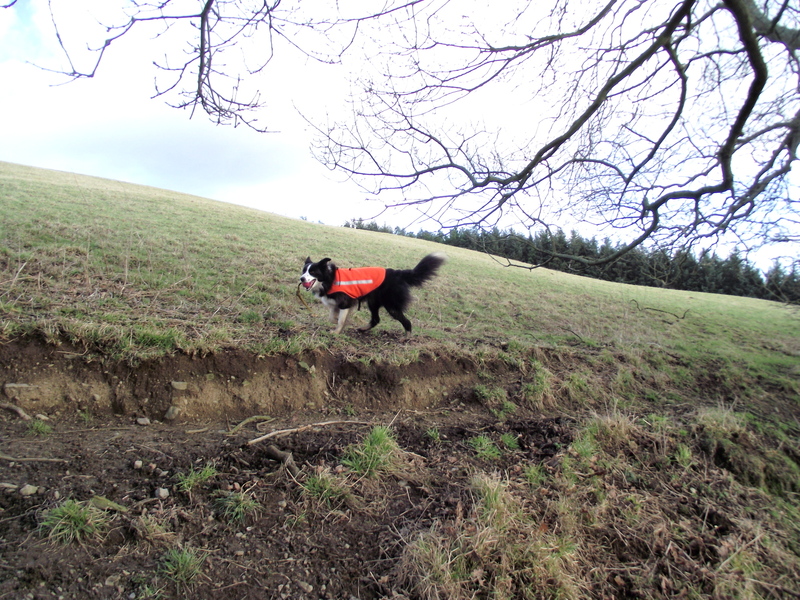 When that can be guaranteed every time, you have a search dog. 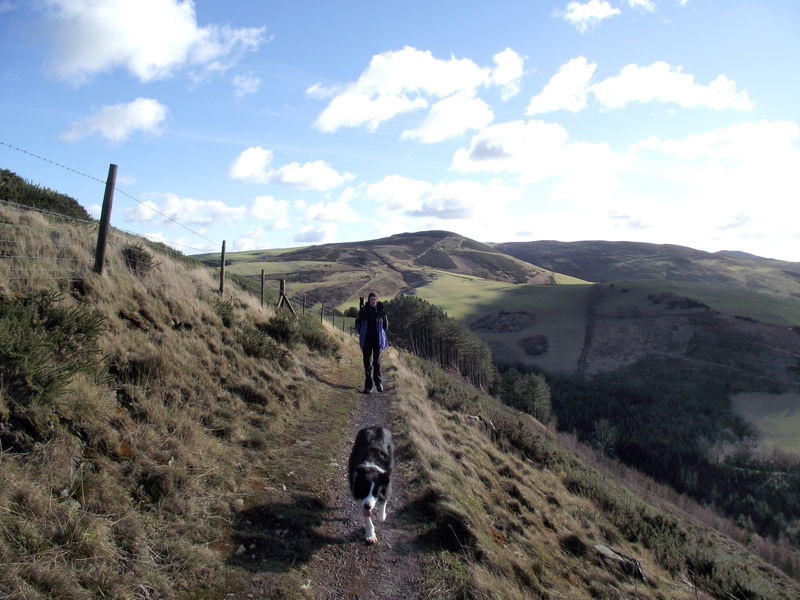 On this training session we did half a dozen short runs before heading back to the car – it’s important that the dog doesn’t start to lose interest in the game. 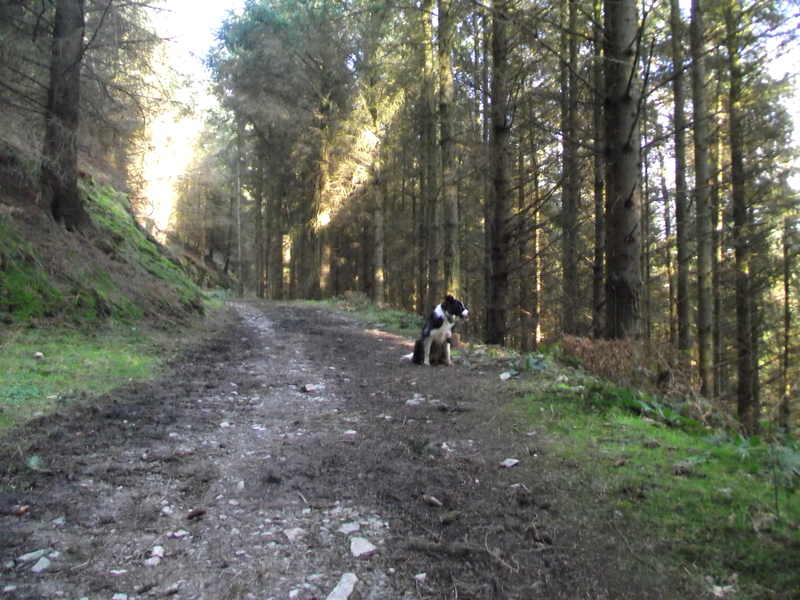 We returned by the forest track that we had seen on the way out, ending up at the car park. It had only been a short outing, leading to quite an early finish. What to do with the extra time? 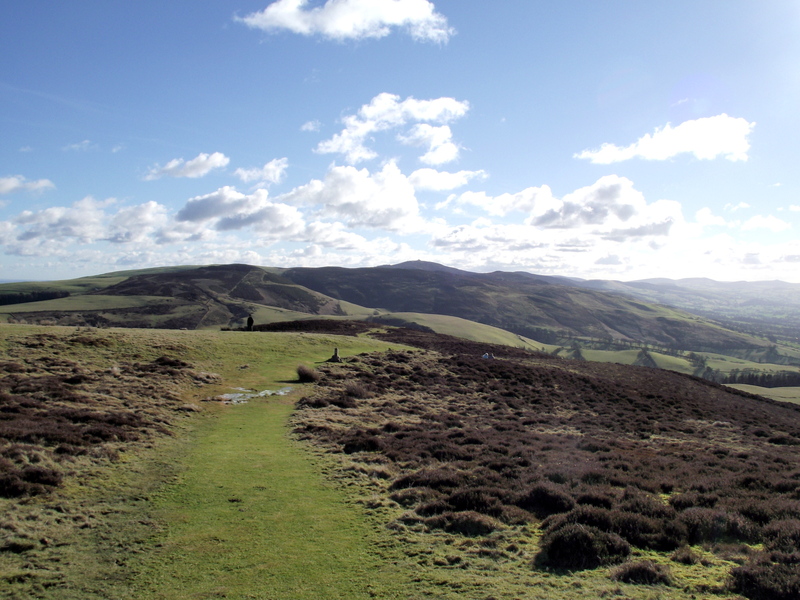 I had an idea – a ‘recce’ to check out the White Horse Inn at nearby Cilcain. It turned out to be a good choice! This entry was posted in 5. 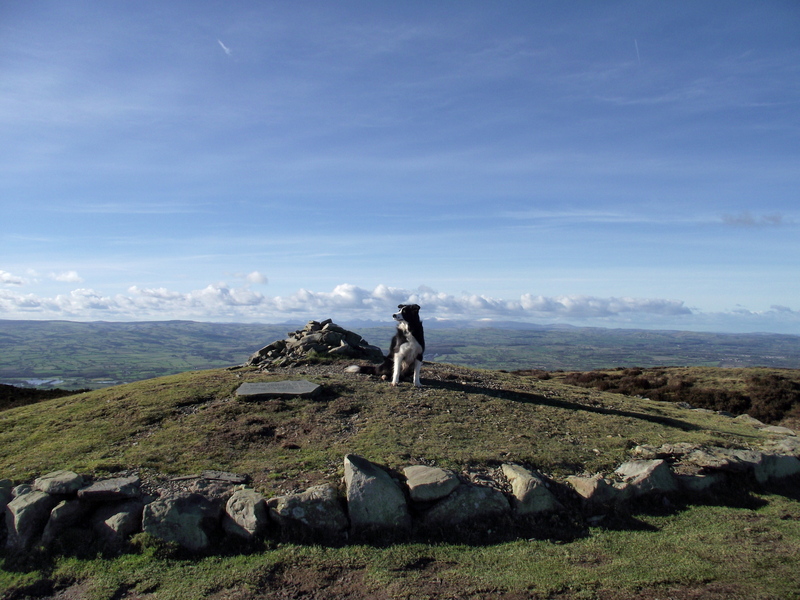 North Wales and tagged Border Collie, Clwydian Hills, mountain rescue, mountains, photography. Bookmark the permalink. 16 Responses to #117 – More history …. and games with the dog! Bet Mist is thoroughly enjoying all her ‘games’ too! An interesting insight into how the dogs are trained! Cheers for sharing. Then I shall look forward to them! 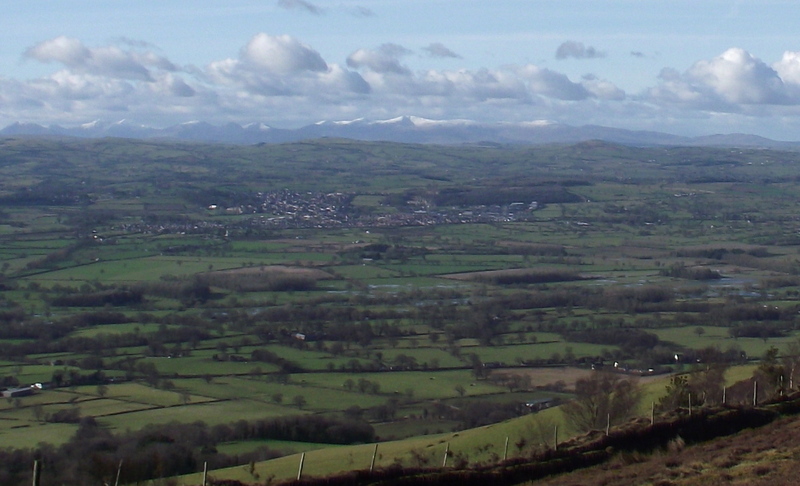 There’s some snow plastered on those Carneddau! What a beautiful day you had. Interesting insights into Mist’s training too. Thanks Sarah, though you would have to go a long way to beat your recent photo of Loki in the snow! That just looks Ideal Paul, and good weather too!